Choosing an idyllic Warwickshire wedding venue for their dream day, Alice and Jose celebrated in style at Blackwell Grange, blending the wonderful cultures of their families with stunning décor and elegance. On the look out for a wedding venue in Warwickshire for their September wedding, Alice and Jose came across Blackwell Grange. 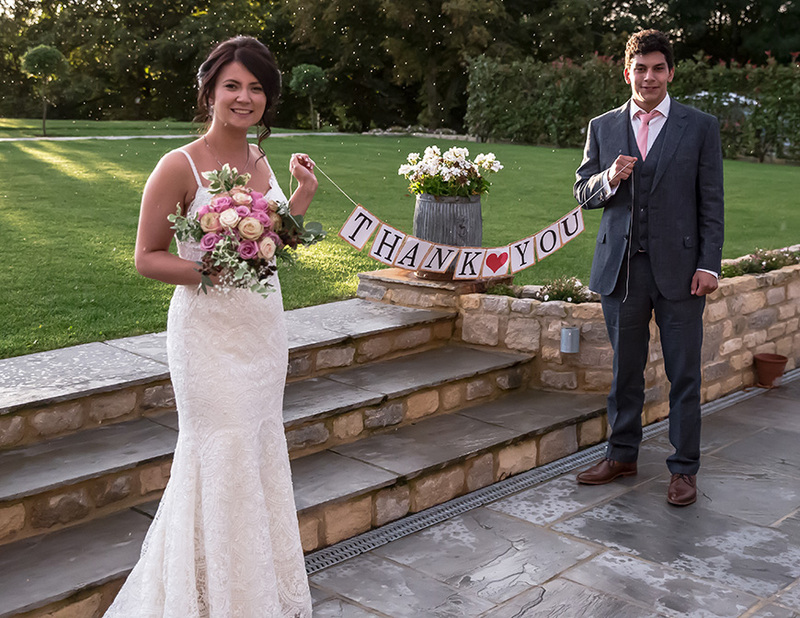 The happy couple chose predominantly natural shades of pinks, creams and slate greys, alongside a selection of brightly coloured blooms, reflecting their cheerful characters and also being sympathetic to the surrounding countryside. Creating a bohemian style, the Thatch Barn was adorned with low lights, candles and individual jars of brightly coloured flowers. The same colourful flowers were carried through to the Orchard Barn and accompanied by herbs in vintage milk jugs balanced on old leather bound books. Succulents were also featured in assorted teacups while Ecuadorian scarves were given as favours to the guests. While brightly coloured blooms were chosen for the venue arrangements, soft and delicate flowers were used for the bridal party. Old English roses, eucalyptus, rosemary, ivy, gypsophila and fresh blackberries pulled from the hedgerow that morning featured in the wedding party flowers. Alice was stunning in ‘Elise’ by Wtoo, a lace gown featuring a sweetheart neckline with delicate straps. She accessorised with a diamond necklace and Ecuadorian pearl earrings, completing the look with soft pink shoes by LK Bennett and a fine lace veil with silk trim. Alice’s three bridesmaids wore beautiful pale pink floral dresses from Dorothy Perkins. Jose and his groomsmen wore slate grey three-piece suits from Marks and Spencer, accessorising with a soft pink silk tie for the groom and floral ties for the groomsmen. Following their romantic ceremony in the traditional Thatch Barn, an elegant drinks reception was held in the bar of the Orchard Barn. Moving in to dine, a salad of crispy duck was followed by pork tenderloin and dauphinoise potatoes. And for pudding... a delicious trio of desserts. A three-tier naked cake with a caramel drizzle and three different flavours also delighted the guests. As the sun went down, wood-fired pizza was served from the outdoor kitchen, accompanied by an old-fashioned popcorn machine. The newlyweds danced their first dance to ‘Como Fue’ by Ibrahim Ferrer and the dance floor filled. Living on opposite sides of the world, this was the first time many of Alice and Jose’s family members were introduced. Keen to breech the language barrier, the newlyweds introduced a ceilidh which created a wonderfully lively, relaxed atmosphere.